We are a group of gardeners immersed in the world of rock gardening. We are eager to share our interests, knowledge, and plants with others. Through meetings, garden tours, plant sales, and workshops, our group provides members with the opportunity to dig deeper into gardening. We are interested in plant cultivation and propagation. Our members enjoy rock gardens, alpine gardens, troughs and other containers, raised beds, bog gardens, sand or scree beds, woodland gardens, native plant gardens, and more. Our location is the greater Philadelphia area. Membership is open to all; annual dues are $15 for an individual and $20 for a household. Download a membership form. We meet monthly from October through April, generally on the second Saturday of the month at 10 AM. Each meeting features a well-informed speaker on plants or gardening. Speakers are sometimes internationally recognized experts and sometimes local experts knowledgeable about gardening in our region. This year's meetings. 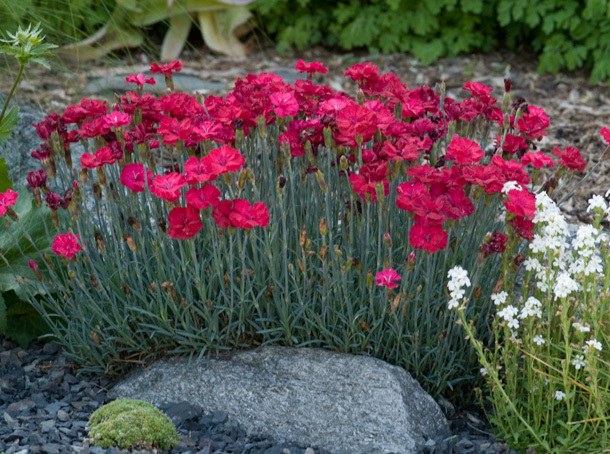 Dianthus 'Frosty Fire' offers fragrance and a long season of bloom. On the right is a white form of the fairy foxglove, Erinus alpinus. Photo by Beverly Fitts. Photos at the top of the page show Dodecatheon amethystinum (jeweled shooting star), Daphne 'Carol Mackie' (daphne), Aloinopsis spathulata (hardy living stone), Trillium grandiflorum (large-flowered trillium), Armeria juniperifolia (juniper-leaved thrift), Euphorbia polychroma 'Bonfire' (cushion spurge), and Pogonia ophioglossoides (rose pogonia). All of them grow in our members' gardens.